This is great man! 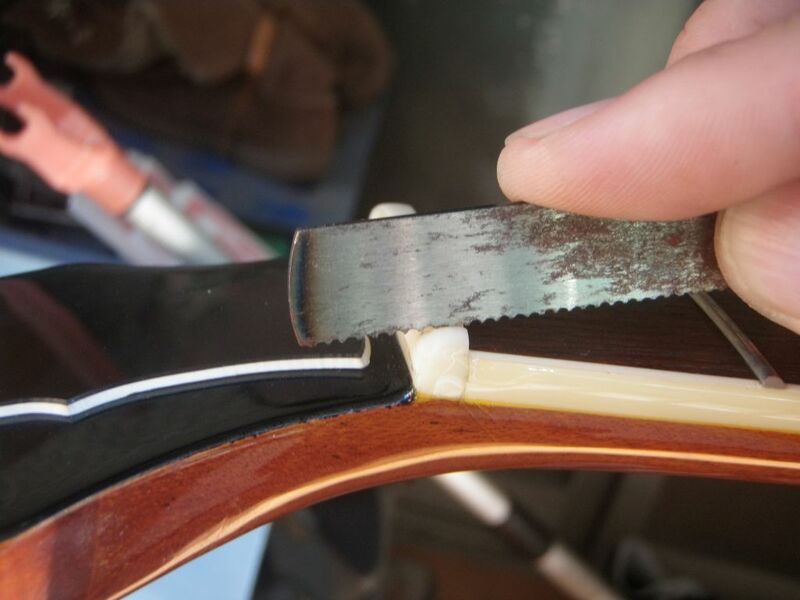 I get really frustrated with the g-string tuning issues on my Gibbys. Might try the nut thing, but very nervous about screwing it up. This is a very clear how to lesson. I learnt a lot. As a long time LP player, i have always struggled with set up but i'll now (when i next restring!) use some (if not all) of your tips to improve the overal set up of the guitar. Thanks for the hard work of taking photos and writing it up. Hi ashley. Thanks for taking the time to comment. Let us know how you get on and don't hesitate to ask if you have any questions along the way. Hi there. great article. quick question. I setup my new les Paul (adjusted neck, bridge height, saddle etc). but my 6th string keeps buzzing all the way when fretted. opened is fine. 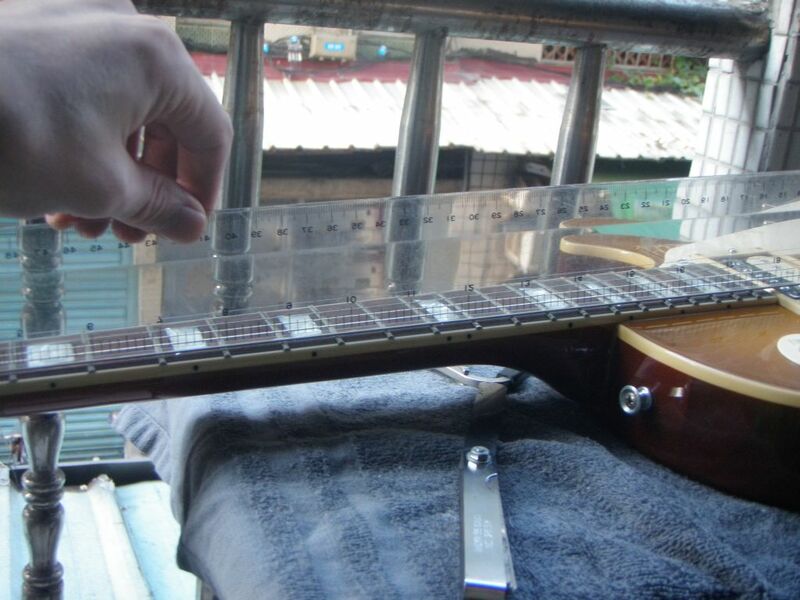 I checked fret level and seems fine. The neck doesn't seem twisted. and changing bridge height doesn't resolve it. If you're getting buzzing all down the fretboard, I'm going to guess that the action is just a bit too low. You're probably not getting buzzing on the open string because the nut is usually cut a little bit higher than absolutely necessary (and that's perfectly fine, by the way). So the most likely answer here is to increase the height of that side of the bridge a little. 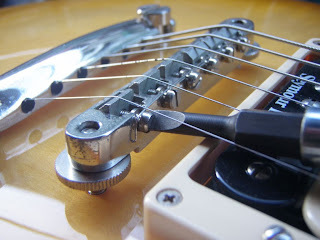 This may mean the 5th and 4th strings are a little higher than absolutely necessary, but it's always about compromise with these things (unless you want to individually file down the heights of each of the saddles, but I'd advise against doing that until you really know what you're doing). Oh wait, you said changing bridge height doesn't help. OK, in that case the only thing I can think of is that something might be loose somewhere, like the adjustment screw on the 6th string saddle or something like that. Can you try to look for something like that? thanks man. Ill check it out tonight and will let you know. I tighten the screw on the bridge it was a bit loose. Seems like it improved. at very low attack it doesn't buzz anymore. still buzzes when attack a little more frankly. Might be normal... I guess you can't avoid that right. Hey Benoit, thanks for reporting back and glad you've been able to improve things. 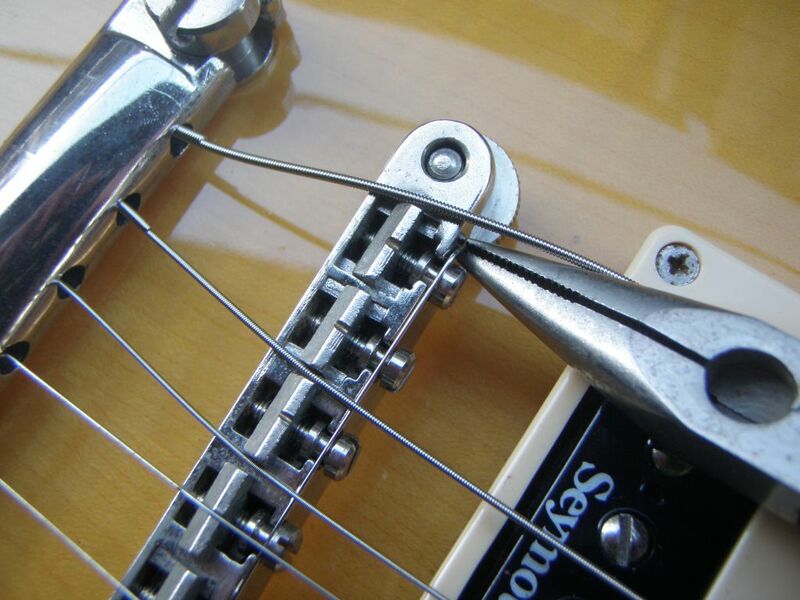 Check the other strings' saddle screws too. You'd be amazed how they might vibrate when the E string is struck. It's often to do with the vibration being just the right frequency to vibrate everything rather than it being for that exact string, if that makes sense. Love your blog! I've been teaching my children how to play the guitar, they're better than me now! 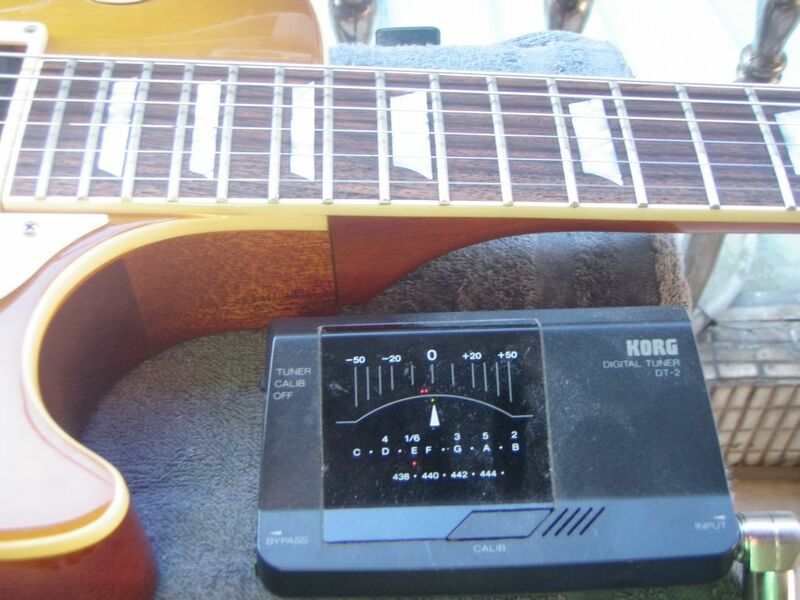 Although, all of us still struggle with guitar tuning without the use of an electronic aid! 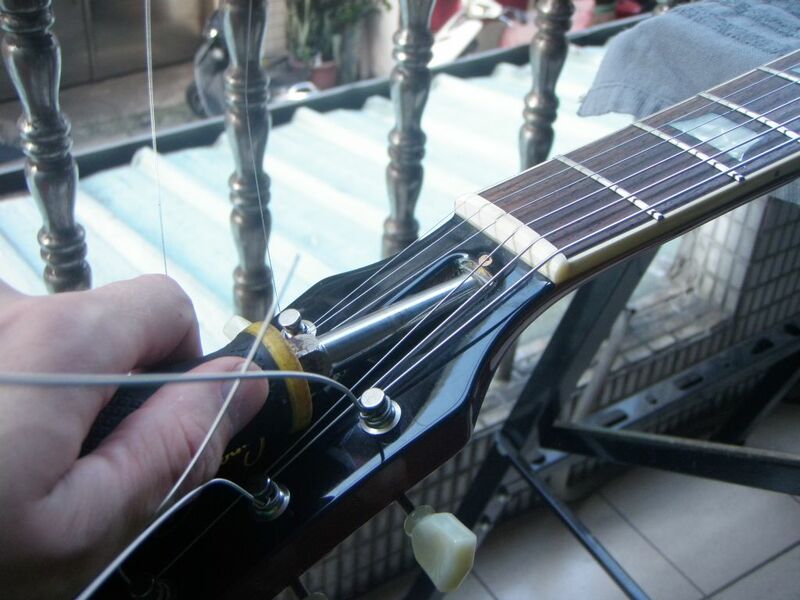 One possible way of dealing with the g string tuning issue (my experience has involved the low e more than anything) is to wind the string on the peg so that the winding goes up from the bottom of the peg, not v.v as it is done at factory. This reduces the angle at which the string sits relative to the nut and neck, potentially reducing the problem caused by the friction this angle creates when it contacts the nut. It will likely have a significant impact on the string staying in tune over time and you don't have to worry about filing the nut. A little nut lube might help too. Btw, credit to TJ at Long and McQuade for that possible solution I mentioned above. Very good tip. Thanks, Cgf (and TJ). HI Stu - thanks so much for you time and comments - great info! Now my question: I recently bought a 2012 Les Paul standard, and I was shocked to see what appeared to be some sort of set screws (2) in the bridge - so I couldn't twist and loosen the bridge screws by hand, and I'm afraid to use force because of the set screws in the sides of the bridge. I have tried a 5/64th as well as a 1.5 metric, but nothing seems to fit. Any ideas as what I can user to loosen those screws? According to those guys, it's 1.5mm, but you said you'd already tried that. There are a couple of tricks you can try. One is to get an allen key wrench that is SLIGHTLY too large and take a small file to it to taper all six sides slightly. 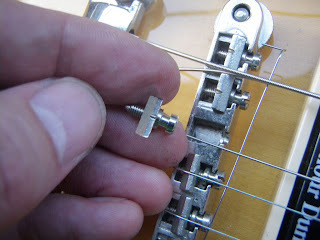 The other trick, which I use sometimes on Stratocaster saddle height screws, is to use a suitably-sized Torx wrench. They're already tapered, and since they're six-sided-star shaped, they grip the corners really well, even if there's a bit of crud stuck in the screw. Let me know if that helps at all, of if you need to ask more. P.S. Just doing some maths here, I THINK a T6 Torx wrench would be the best fit for a 1.5mm allen key screw (Torx T6 measures 1.7 mm point to point, while a 1.5 mm allen key screw measures 1.73 mm point to point). My apologies if it's one either size of that. I have a full set, so I usually just try a few till I find the right one. I have seen on a video where a guy has actually a little bow on his neck and says its fine. I have a bit as well as i was buzzing a bit and this cured it. My friends Standard also has a bit of bow, he's plays in a regular band and says no problem with it. Is this correct or is bow no go. Indeed, a little bit of bow is OK. 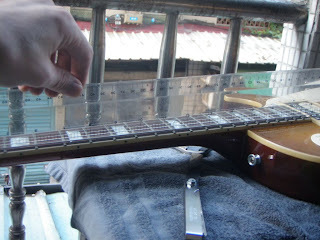 In fact that's what we're doing when we make sure there's a gap of approximately 0.012” at the 8th fret. But as mentioned in the article, this is personal choice; some people prefer a bigger gap here, some like less, but 0.012” is usually a good starting point. As for buzzing, some people are OK with a little bit. Mostly as long as it isn't heard through the amp, a little bit is acceptable. Again, it's all down to personal choice. thanks for all the info just set up my studio and no more tuning issues just gonna do my 58 vos custom now.keep on playin. Great article I ran through it on my Les Paul. Thanks Again. 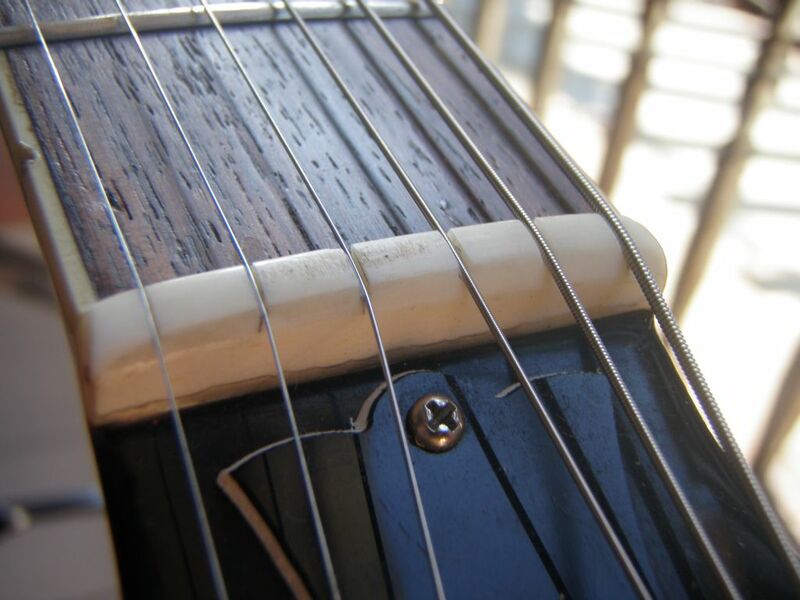 I recently ran into a problem with intonation on my LP's low E and A strings after moving to a heavier gauge. I do most of my practicing and writing on an old acoustic with horrible action and have developed a death grip to prove it. The move to a heavier gauge on my LP helped without to much of an adjustment of my technique. Anyway, the intonation was driving me crazy! For some reason I never thought about flipping the saddles around. Thanks for the solution to a very frustrating couple of weeks! Thanks for the article. Thorough,and easy to understand. Your tips have helped turn my buzzy LP stidio into a smooth operator. Thanks again for the positive comments. Anonymous, that's tough one. Usually, breaking the D string would be down to two things - a sharp edge on the saddle (unlikely if you're using a roller bridge) or your technique. The only other thing I can think of right now is the break angle (how sharply the strings pass over the saddle on the way to the tailpiece). Perhaps raising the tailpiece (or feeding the strings through from the front and then passing them over the tailpiece - you could do this second one with the D string only) might help. So just to throw this out there- I've been trying to figure out how to set up electric guitars on my own for years and could never get it remotely figured out. At about 11:30 pm last night I decided to take a garbage fret buzzing machine of a guitar and try again. Your blog is the first time I've comprehended and successfully set up a guitar!! I'd buy you a six pack if you were in the neighborhood! Hey Joshua, glad it was useful and thanks very much for taking the time to comment. Thanks for the great article! I've recently purchased my first LP (I've been playing Strats for 20+ years), and I've found that I'm chording heavy, I knock the low E string off the saddle. Any tricks to keep this from happening? Thanks! 2. Do your saddles have notches cut into them? If not, then I suspect they could do with some (or if they have, but they're extremely shallow, perhaps they need deepened a little). Just note, however, that this is very easy to screw up and should probably be done by a tech if you're in any way unsure about doing it yourself. Also, you can't just cut a notch in one saddle. You would have to do all of them to the same depth, then raise the bridge a little to make up for the depth you just removed. Other than that, I can only really suggest looking at your playing style, but we both know that that's easier said than done. Man, did I come across this at the right time. The description on the diagnosis of bad intonation describes my LP perfectly. I've also noticed that if I tune (by ear) an open E the way I like it then a D is off a little and so is an A. It tends to be a compromise. But playing chords up the neck is an issue that I think I can finally fix. This is a really great article, and I'm very grateful for the advice. I wanted to ask about intonation, and changing the orientation of a saddle (unscrewing it from the screw and then screwing it back on in the other direction). I have to do this with my G and B strings as the intonation is way off for those, and I need that extra distance to bring the saddle back, away from the picks even more - the fretted note is much higher than the open. Having changed the screw around, however, I've found no positive difference. In fact, if anything, it's worse and the difference between the two notes is greater than before. I guess my question is, how does changing the orientation of the saddle offer any extra distance? The string length is largely still the same, no? Where does the advantage come from, or how is it effected? I'm fairly new to setting up on my own, so I'm sure it's just a beginners confusion, and a failure of my imagination. But any further information about this would be helpful. I don't know how I've gone wrong, and I'm not sure how exactly it was to help. Anyway, thanks again; the article is really helpful and has generally cleared up a lot for confusion for me. *sorry - when I said picks, I mean pick ups. Thanks. Good questions. Firstly, swapping the saddle around has the effect of moving the tapered top edge of the saddle closer to, or farther from (depending on which way it was to start with) the front of the bridge. If you're wanting the string to be as long as possible, for example, you'd need to make sure the saddle is oriented in such a way that the tapered edge is at the tail end (farther from the pickups). If you look at my pictures above, you'll see that my D-string saddle is originally oriented in this way, but in my case I need to SHORTEN the string, so I rotate it and this gives me more forward adjustment. Since you need to do the opposite of me, you'd therefore need to make sure your saddle has the same orientation as what mine had BEFORE I changed it. I really hope that makes sense. Now as for flipping the whole bridge, yes, in some cases this may help you. Try it out and see what happens. Just an extra mm or two could make all the difference. One thing to watch out for, though. The notches on your saddles might not all be the same. Often you will have wider notches for the wound strings and thinner notches for the unwound strings. So you might have to swap these all around. Another option you might want to think about is that some replacement bridges have more adjustment range. This is great! Thanks so much for the info. I have LP custom and an Xaviere LP style that needs attention but was afraid to try setting them up for fear of making them worse. Step by step set up info, this is fantastic. Thanks so much! I'm not supposed to do the nut job after adjusting the neck bow and bridge height? Hey Omer, I'm not really doing much to the nut here other than widening the slots, so I don't need to measure any heights, etc. For that reason it doesn't matter when I do it. However, if you were to do a proper nut job, then yes, you should probably do that after setting up the other stuff (if you suspect you're having any nut issues, then just put a capo on the first fret and set everything else up first). But if you have no reason to suspect a bad nut, I'd advise you to just leave it alone. Thanks you rock. I have been playing for a while and was afraid to setup for fear of messing it up. 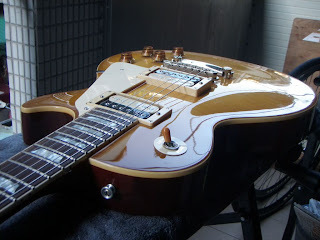 Your step by step worked great on my new Gary Moore Les Paul and now rocking on. So if I understand correctly, check the neck, set the bridge height, then intonation? In that order? I guess nut height would be first? I missed your comment for some reason. That's right. It's neck first, then bridge height, then intonation (at least the way I do it). 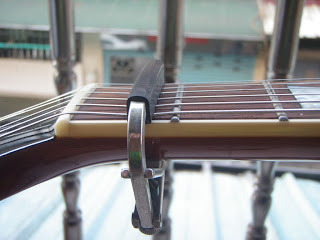 Nut height can be taken out of the equation by putting a capo on the first fret, so it can be sorted out later if there are any problems with it. Of course if you were to put a capo on the first fret, you'd need to compare that with the 13th fret when setting up the intonation. Well you have two options that I can see. First is to try a different string or two, which is cheap and easy. Anyway, good luck whatever you decide to do! Oh and if you do decide to go for a wider bridge, make sure the other dimensions line up with your current bridge so that it's a direct replacement. Great guide! I would like to add that i noticed that a little string buzz is no problem when you dont hear it, as in not hearing it because your volume is high enough. When i play at home at low volume the sound of the pick and the little bit of buzz is annoying, but when i play with headphones or loud enough i dont mind at all. Something to take in consideration before you get fustrated because there is still some buzz but setting it the strings higher sacriices playability and intonation! Hi there the article is very helpful especially the additional solutions for people like me who always seem to have the guitar which doesn't fit the standard profile. the kneck is strait, the strings are new, but still I can't get the saddles far enough back to get it in tune at 12th fret. I'll look for a wider bottom which may well give me the extra adjustment I need Thank you very much a most informative article. Hi everyone! I have a quick question regarding string action. 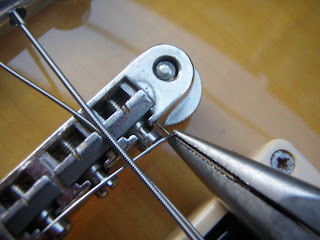 I have just gotten my 2003 Standard set up a few months ago, but I am having trouble with how low the action is; strings slip off of my fingers during bending now. 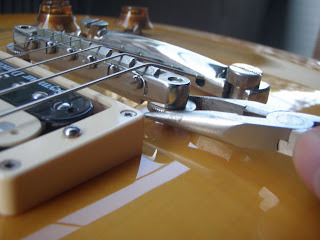 If I just turn the screws on the Tune-O-Matic bridge to heighten the action a little bit, without touching or adjusting the truss rod, individual saddles, or tailpiece, will that screw up my intonation? I'd say you should be fine unless you move it a lot. Firstly, thanks for your step-by-step set-up guide, it is really helpful. 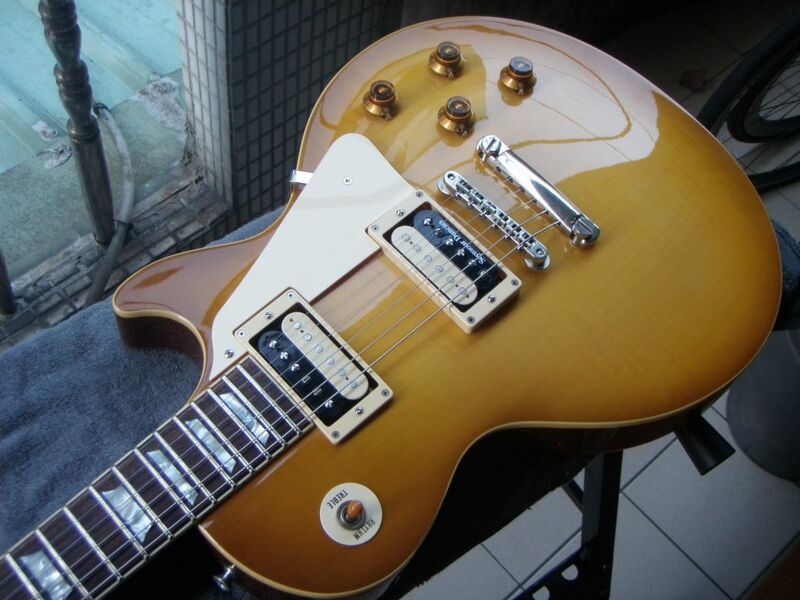 Secondly, I have an Epi Les Paul 1960 Tribute that i had PLEKD, which made a big difference to how it plays. However; i have an ongoing issue with it since, the G string always plays muted - i have changed the strings several times since but to no avail, other than that it plays really well in my opinion albeit i am only a learner with little experience. I have gone through the steps in your article but again all to no avail - have you any ideas as to what may be causing the muted tone (that's how i'd describe it anyway) and any thoughts on a possible solution you may have would be welcomed. It's Mal - i posted the comment ref the muted G string on my Epi Les Paul 1960 Tribute - thanks for your response it was very good of you. I'm going to be playing (when i say playing i really mean faffing with) my guitar later so i'll have a look at the saddle, though i have rubbed my finger over it to see if there were any obvious issues which there wasn't. I have also rubbed the graphite from my clutch pencil over it when changing strings - no improvement; i'll get magnifier out and take a closer look and let you know, i may take you up on your kind offer if i'm still stumped. Great question. My apologies for the longwinded reply. Firstly, no, it doesn't really matter. You'll find plenty of guitars with the adjustment screws facing backwards and plenty facing forwards. It's basically all about access, or rather which way around lets you get a screwdriver in there easier to adjust them. If you find that one way works better than the other, then by all means go for that. Now that said, the orientation of the individual saddles does have some significance. In an ideal world, you would have all of the saddles sitting with the flat side facing the pickups. 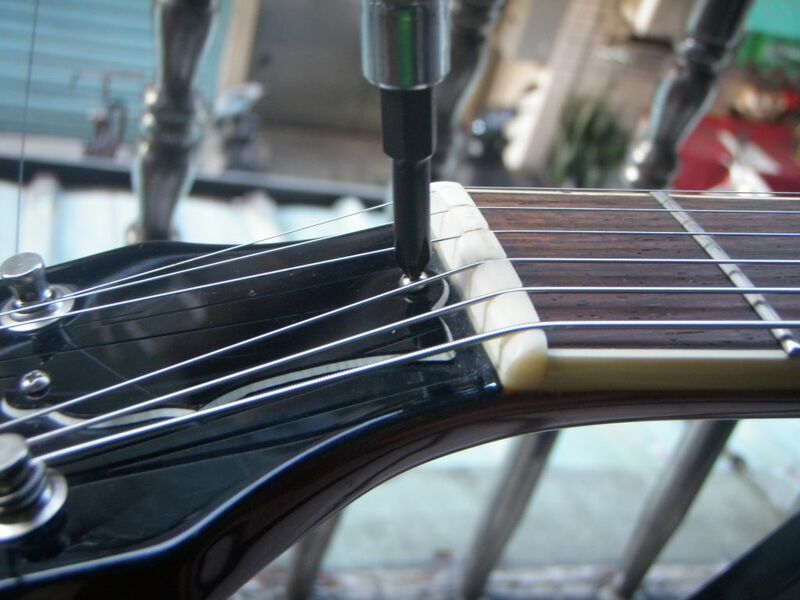 This is so that there is an immediate fall-off as soon as the strings clear the saddles so that they vibrate as cleanly as possible. At the same time, the fall-off towards the stop bar tailpiece is a little more relaxed and possibly a little more forgiving on your strings. In the real world, however, you may have to swap one or more around in order to intonate the guitar properly, and this is more important. You will probably see plenty of guitars out there with three of the saddles facing one way and the other three facing the other way. To be honest, in most cases this is perfectly fine and it would make no noticable difference to the sound. The solution is pretty simple actually. When setting your intonation it should look like two sets of steps. You should never need to move the saddles all the way forward or turn them around. If you want to adjust something do it in a way that allows you to keep this configuration. 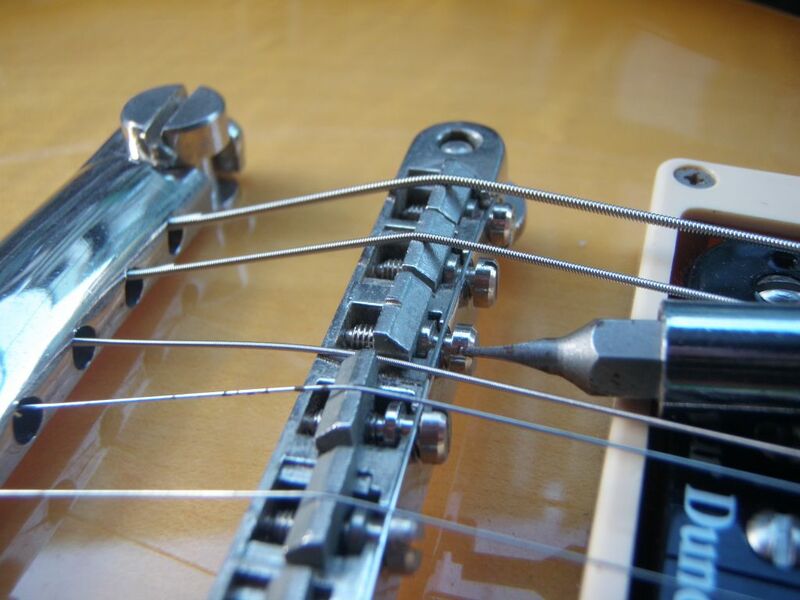 You do that and you'll never have to worry about tuning issues period, let alone a g-string. the annoying frequency comes only after 1 or 2 seconds after i hit the note. other than the tone is good and its not bassy . It is recommended that you only turn the tool a quarter turn at a time or even one eighth and then give the neck some time to settle i just like in this. I have a problem with the way the neck bows going down from the low to high e strings. 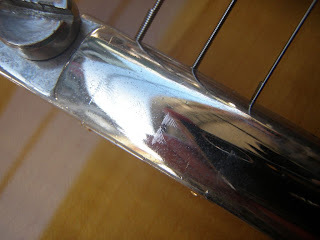 I have a Gibson les paul with the recent change in seasons I notice it on all my guitars I can adjust it out but it will some times just do the same thing, I see this on my fender and my Acoustic guitars as well when I adjust this I have a lot of problems with tuning I know this is not exactly what we were talking about but jut a question I wanted to ask I hope I made what I am saying plain enough I am pretty new to all of this. Thank you for all the great info. Sounds like you're living in a pretty guitar-unfriendly place! No simple answer to this one other than keeping your guitars in a climate-controlled environment (temperature and humidity). Great stuff ...just about to set my 2016 studio up ...this helps. My Les Paul never did sound quite right. It was always off somehow. I discovered it had the same problem like yours with the intonation being off the scale. Once I followed your guide, I discovered the neck adjustment was far too loose, and gapped it properly. Shazaam, the intonation problem disappeared, and now it plays like butter with all the notes dead on! U R the MAN! Very informative. But I have a question. I want to put of 10-46 strings on my guitar. Should the gap still be 0.012” or should I make it 0.013” since the B string would be 13? Does the gap need to directly correlate to the B string? 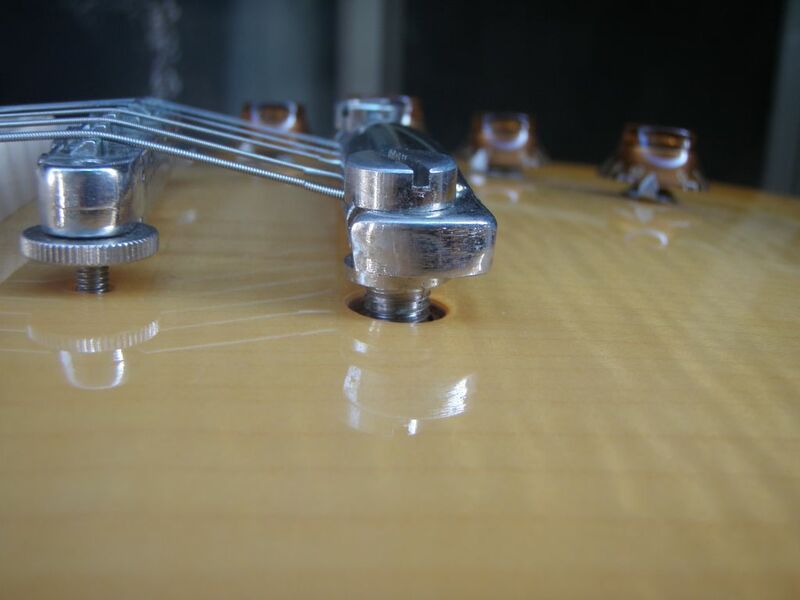 Was told years ago by a guitar tech that in lieu of a feeler gauge a Fender Thin is also the proper thickness. Have used this ever since. I have a Samick Avion AV7 that I've been having trouble with a buzzing low E string when strumming with the first four frets. The bow is .013" and I set the 12th fret E string height to 2.5mm which helped, but not cured. I used a depth gauge to measure my frets, most measure at .043-.045" but the last two frets (21,22) measure at .052". At this point, would it be best to loosen the truss rod a 1/4 turn, or should I address the high frets, or could it be something else altogether? Thanks for the information. thank you so much , i appreciate your help with this bridge. goosebumps omG- words cannot say it is so gnarly just to look at and stare at the original headstock decal in reaL life..
that it shoulda or coulda' been a string through at factory..
-it was a Voyager by Arbor -i lost it in 1993.
it had a string through w/ hard tail saddle type bridge- set up. the dean 'LP' type guitars. or maybe different type saddles- thank you again- and i hope you all have a great day -and i hope if you are looking and searching for your long lost axe ,then i hope you will find it again as i have found mine.. Thanks again for the comments and feedback. TheMrsexy14, I'm sure either would be fine. You're talking about one thousandth of an inch of difference there. JLM great tip! Thank you. Anonymous, it's very common for the last few frets to purposely have a bit of a fall away, so don't be concerned that there is a bigger gap here (in fact it's a good thing). You're right that it could be something else altogether. Maybe a screw rattling, for example (not even necessarily on the bridge). Cirith7 /¡¡\, there should be no reason why you can't keep using that bridge as long as you can adjust it to a suitable height and the saddles follow the radius of the fretboard. Congrats on finding a perfect replacement for your long lost guitar (I've done that twice now, so I know exactly how you feel). Stu, thanks for the great lesson. I'm having an issue with the high E string. It's basically dead, or gives off much lower follow when I play slide. Any thoughts? Could be a couple of things. Either it's hitting off a high fret, or more likely the saddle is killing the string's vibration (that can be caused by the string sitting in a slot that does not have a sudden enough drop-off, for example). Try slackening the string and lifting it to the side slightly on the saddle (like 1 or 2 mm), then tune it up again. If that sorts out your problem, at least you've identified the cause. Thanks Stu. Appreciate the feed back. I will let you know how it goes. Thanks for the superb write up! I let a "friend" borrow my les paul for a bit whilst his guitar was being repaired (as I preferred playing my other single coil guitar), I hadn't used that guitar for quite a while after he returned it. Not much long after we had a disagreement about something else and we stopped talking. very recently I've been trying to get a band together where the Humbuckers of my les paul would suit the sound a lot more and decided to pull out my les paul, on trying to tune it, I noticed the intonation was a little off on all strings (not particularly noticeable by ear, but plugged into a tuner one could see it was off), but on the high E string it was very much off, from the third fret and higher it is very off sounding. inspecting the guitar the strings sit lower than before and touch the higher frets, the high e string is wound backwards, and it looks like the neck might not be straight, but of course I can't just ask the person who borrowed it what he's done to the guitar. I've never attempted to set up a guitar before, I've changed strings, but that's about it. 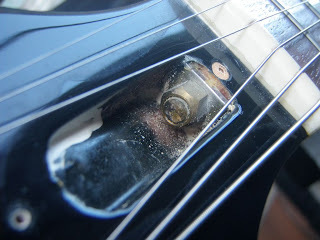 should I attempt to fix this myself following your guide, or should I take it to a guitar shop? I feel like learning this would be an invaluable skill, but I'm nervous as it would be my first time doing this. what tools would I need, other than a ruler? Just got a 1995 Les Paul Classic (same as a Standard). A lot of rocker / bow in the neck so I reduced it. What about raising the Nut. I can't get the bridge high enough, or do you add rocker even though it was .025" as you recommend .012", I like a low setup. Great guide sir,never owned a LP,but acctually just bought one,my wallet said "no Gibson dude" so i bought a very well made "other brand" from Thomann. 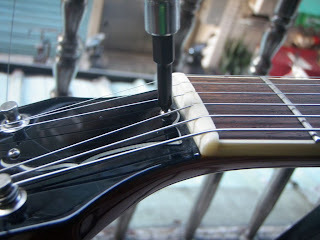 Guess if you have to set up an expensive Gibson my cheaters version needs it to. I have a Gibson SG Special aswell,and havent touch any of the setups since i bought it (2011) but im gonna have an overhaul of that one to. This is a great guide that made my LP sound and play much better. Your recommendations are far better than anything else I have found on the internet, or in tune up books I have found. Thanks for putting this together! Hi there man! Great guide! I am trying to adjust my 1982-83 Burny RLG-120. It had very low action so it was buzzing like crazy. Replaced the strings with 10-46, raised the bridge and it's still buzzing when playing open strings. 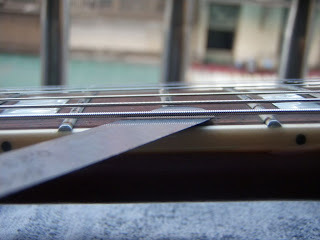 I gave some relief to the guitar, just enough to be able to move a business card on the 8th fret. I think the truss rod adjustment is ok now. Strangely it's still buzzing. I compared the height of the bridge to my Navigator N-LP-380LTD and i have the same height on the RLG-120 the same. The string that buzzes the most is the D string!!! E and A string buzz too but less than the D. Don't know if i want to raise the bridge more. G B E are ok! Don't know if the D slot on the nut is too low. Seems like the slots on the nut on my guitar are higher than the ones on your Burny. Don't know what to do. Frets seem even. Any chance it's the saddles or something? Do they play a role on buzzing. I will raise the bridge tomorrow morning and see how it goes. Any idea what should be a standard string height on these guitars? Lets say height on 1st fret, 5th fret, 8th fret, 12th fret, 16th fret, 22nd fret. Can we say that? Can you tell me yours to check with mine? 1. Intonation: I have a brand-new Epiphone LP that will not completely intonate on the G, A, and Low E. Fretted notes remain sharp. I have replaced the factory strings with new Ernie Balls and tried every trick in the book to move the saddles as far away from the neck as possible. Many LP owners have this problem. Other than returning the guitar to Guitar World, my only other option is swap out the factory bridge with a wider one. You mention the latter option in one of your early comments, and I've decided to try it. I just bought a Gotoh one online. Hopefully, that will solve the problem. 2. Pickup Setup: I'd like to see you add a section on this. Pickups should be lowered out of the way before any setup. If they're too high, the strings could hit them and cause buzzing. 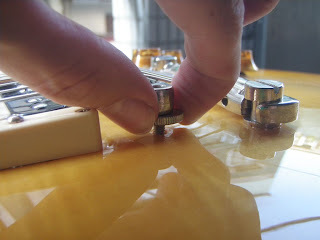 After everything all other setup steps are completed, the pickups should be raised to the proper position. One online video claiming to post Gibson specs says that the Low E should be 6/64" above the pickups, and that the High E should be 4/64". Thanks for taking the time to write this excellent guide. Really clear and easy-to-follow: I've always been comfortable correcting the intonation on my guitars but have always been a bit unsure of correctly setting the bridge height and truss rod tension, so this article is exactly what I'm after. but don't know which one is better, do you have a recommendation for me? The "Les Paul Handbook" from Paul Balmer or the "Les Paul Manual" from Terry Burrows? This Gibson guitar sound is pleasing one and on the other hand, is made of quality material which adds to its longevity period. Besides, these guitars are offered for sale at the exclusive price. Moreover, a majority who aim to avail quality benefit from the product can easily shop for these guitars. Hi. Terrific tutorial. Thanks so much for taking the time to teach all of us. I have a LP Classic of recent vintage. I performed all of your steps to correct what I thought was an intonation issue but even after successfully getting the open strings to match the fretted 12th I'm still having the issue. For some reason when playing an open D chord, for example, the G string's pitch varies depending on where within the 2nd and 3rd frets I place pressure. Any suggestions on how to correct? 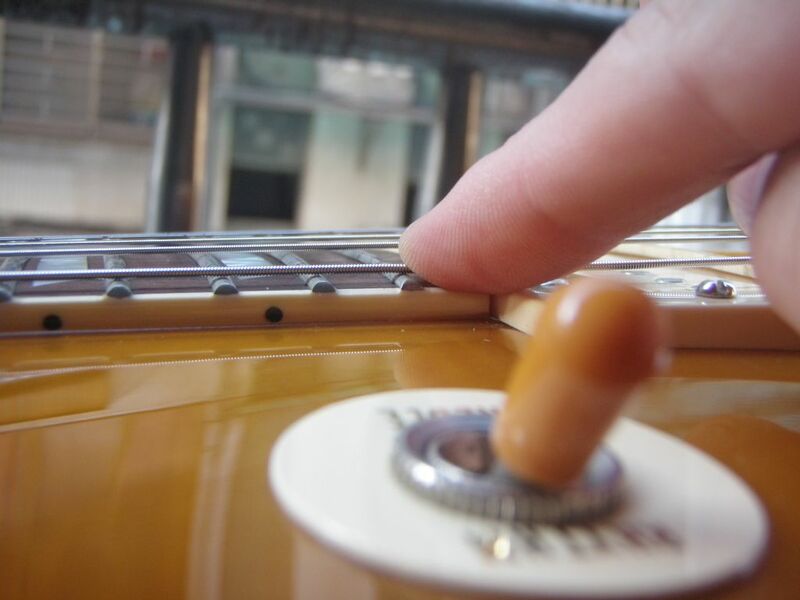 It only seems to happen on the lower fret positions. Thanks so much.